This draft of this post has been sitting way too long in my folder. Finally, I managed to edit and hit the publish button and get it alive on my blog. It’s been quite an exciting and busy fortnight since I officially got a bookdeal from a large, prestige publisher. The theme of my first cookbook will be simple recipes for home cooks, with many of them are classic Hong Kong dishes that I grew up with. Please bear with me for my posting backlogs. Back to my favourite fruit, pomegranate. Pomegranate juice is a very healthy and refreshing drink in summer. Although it’s still cold down under here, I love making desserts with its lovely juice. After I made the pomegranate soufflé, immediately a fan posted a question about how to juice pomegranate on my fan page. The arils, wrapped inside the white pulp membranes, compose of edible red-diamond-like flesh and white hard seeds inside. Trying to get the lovely juice from the edible flesh sounds quite troublesome, yet it’s worth the work. Here’s a hack around that I experimented, much easier than I thought. 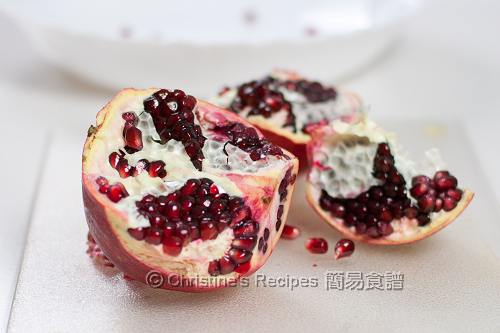 Hold the half pomegranate in your palm with cut side down as picture shown. Place a large bowl underneath. Use another hand to smack the rind with a large spoon. 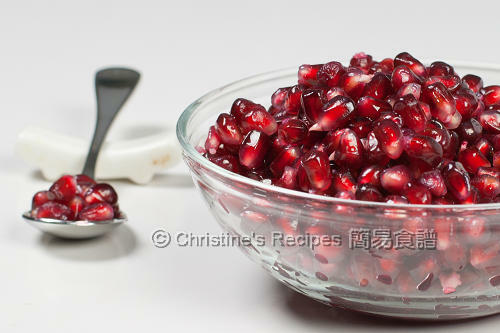 The seeds should eject from the pomegranate directly into the bowl, leaving only a few deeply embedded arils to remove. Repeat this step with another half until you get all the seeds out. Transfer the seeds into a food processor, briefly grind the seeds. Don’t blend too long, because the juice becomes bitter if too many hard seeds inside are broken. 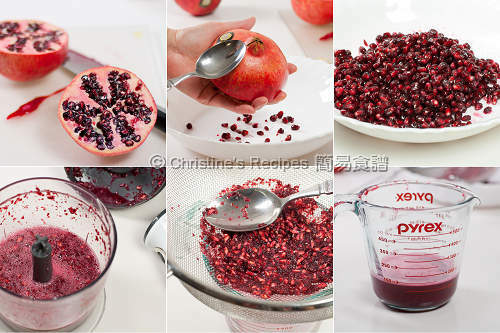 Strain the juice through a fine sieve with the help of a tablespoon and lightly press. You’ll get clear and fresh pomegranate juice. Hi Christine, I'm new to your blog (saw you on Penny's). Congratulations on the book deal + I love this tutorial! Congrats Christine! I've been a loyal follower and I love your step by step photographs! And this is indeed the fastest way to juicing a pom that I've seen so far! Congrats on the book deal! Looking forward to seeing your book when it's published! Congratulations Christine!!! All the best to you on the book deal. Congrats Christine..can't wait for more news! Thaks! That was indeed quick and easy steps. WOW is all I can say thank you some fir the how pom will stay in my fruit bowl. All great wish on the book. Congratulations on your book deal! I love your blog and it's great you've got a publisher! When is it available? And more importantly, will it be available in the UK? My cookbook is scheduled to be released in the first half of this year. You can place an order via their online store. Will keep you updated on my blog and facebook fan page. Stay tuned.